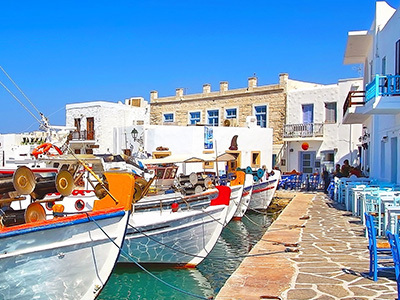 Paros is an island to suit all tastes with a variety of sights and destinations to explore. You can easily rent a motorbike or quad and drive to some beautiful places around the island not accessible by public transportation, like Kalogerosor “Clay Beach”. Here, you can use clay from the rocks around the beach tohave your own cleansing spaand then wash off in the sea!A short uphill drive takes you to the top of Kefalos hill with the 17th century monastery of Agios Antonios and amazing 360° views over the whole area. Moving north, follow the shoreline passing from the sandy beach of Molos all the way to the secluded beach of Tsoukalia, via a dirt road ideal for a buggy. It’s great fun making spontaneous stops for a quick swim throughout this route. Time-saving is a good reason to have a motorbike rather than rent a car during your holidays on Paros, as you can easily skip through traffic at the main towns of Parikia and Naoussa, especially during the days of local celebrations. The biggest celebration of the island takes place in Parikiaon August15th, the day of the Ascension of Virgin Mary, a time when the town is bursting with visitors and worshippers from all over Greece. At night fireworks adorn the skyand underneath the Venetian Castle music and dance showsstir up the party mood until late. On August 23rd, during the celebration of Mother Mary’s Novena, Naoussa hosts the day of the Pirates –a reenactment of the16th century invasion of the village by the pirates of Captain Barbarossa and the locals’ fight for their freedom.On that evening, the Venetian port and surrounding streets are full of people, dance, music, fake pirate fights and of course souma –the local alcoholic drink. From the port of Naoussa, mount your scooter or ATV and take the seaside road starting from Limnes area. With the Aegean breeze accompanying you all along the way, you pass by the ancient Mycenaean acropolis, the beach of Kolimbithreswithits unique rock formations that look like modern sculptures,and end up at Paros Park, a natural area with a variety of beaches, water sports centersand an open-air amphitheaterwhere you can attend various music and theatrical events with the moonrise in the background. For magical sunsets, one of the best spots on the island is the temple of Apollo at Delion hill in Parikia,offering panoramic views to the whole town, the port and the open sea. If you drive up here well before dusk, you canfollow the dirt road going down the north side of the hill and arrive at the secluded beach of Chochlakas – a route that’s best to do on a quad. Paros has an efficient road network that connects all the villages of the island so it’s fast and easy to get to various destinations, without being bound to the municipal bus schedule. It’s worth visiting the mountainous village of Lefkes,the impressive old capital of the island, as well as the traditional villages of Prodromos and Marpissa where the 3-day festival “Routes in Marpissa” takes place at the end of August. This festival is organized by the people of the village and hosts original cultural events, including open-air concerts that can go on until late at night. Vehicles are not allowed inside the traditional settlements, but you can easily park your motorbike at the entrance of every village, even when the municipal parking areas are totally full of cars. Coming back to the main road, heading south, you’ll drive by some beautiful spots where you can hop-on and off your motorbike or buggy at any time and take selfies with the open sea in the backgroundand the islands of Heraklia and Ios in the horizon.Moving on further south, you reach Aliki area for more underwater exploration at the beaches of Pisso Aliki and Voutakos –and some tasty fish at the local restaurants. 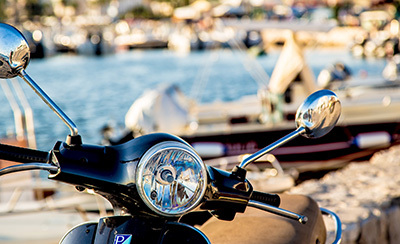 Driving a motorbike on Paros makes it easy to stop anywhere you feel like for swimming or dining at any moment. Following the road to the west of Aliki, you arrive at the small port of Pounta. If you are in the mood for some island hopping, board one of the ferry boats that can transfer you and your bike to Antiparos in a mere 5 minutes! 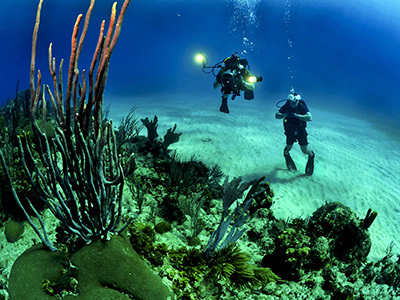 Antiparos is a rather small island but has countless natural beauties to explore, accessible only by car or motorbike. The most popular attraction here is the large Cave of Antiparos with impressive stalagmite and stalactite formations, and the signature of Lord Byron carved on one of the rocks! If you want to combine swimming with a nice meal, visit the cosmopolitan beach bars at Apadema and Soros beaches, but if you are in the mood for some quiet time by the sea, find the hidden beach of Feneromeni or follow the road signs to Livadi –a long, sandy beach where you can enjoy riding the waves with a small board on days with north winds. If you feel like exploring more secret spots, the seaside road towards Agios Georgios has numerous tiny beaches to enjoy swimming with privacy. At the fishing port of Agios Georgios you can leave your motorbike or buggy under the tamarisk trees and hop on the small boat that takes you to the desert islet of Despotiko – with some beautiful natural sceneries and the excavation of the ancient temple of Apollo. Our suggestions above cover just a small part ofwhat you can do and see on Paros and Antiparos. To discover even more, ride a motorbike, put on a helmet, wear some sunscreen and loose yourselves in the magical atmosphere of the Cyclades. Follow your instinct andtake any road that inspires you. It will surely lead you to an amazing destination!